This is just one of several methods used to create a new page. 1. Click on the action button . 2. Select Create New Page. 3. Optional: Select a namespace. Namespaces are used to categorize pages and appear as file folders. If you do not select a namespace, your page will simply be stored unfiled. 4. Enter the page name in the field at the bottom of the window. 5. Click on the Create New Page button. 6. When your new page opens, you may add a Headline by using the toolbar. 10. Link to your page on other wiki pages using double brackets around the page name. 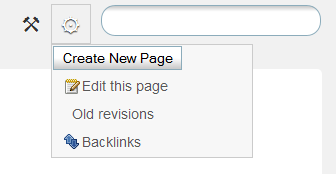 You may also link to a newly created page using the Internal link button in the toolbar.